Are you seeking freedom from anxiety? Great, because the Free Your Mind from Anxiety program has been built to ensure you accomplish just that. An educated guess would tell me the help you've received thus far — if any — hasn't helped. In fact, it's probably made things worse. I get it because I used to be in a similar situation. Yep, anxiety, panic attacks, and the associated depression crippled me for years. I'm sure you hate the fact that it's come to this, because who wants to spend their time searching for a solution to anxiety—especially when you've goals you want to accomplish and a life you want to live?! It's a societal problem and a full-blown epidemic that's only getting worse with catastrophic consequences. I want to help you change your life today because I know I can, and in doing so, you can go on and help someone tomorrow. This program was created by a recovering perpetually anxious person to ensure others suffering from anxiety, panic attacks, and the associated depression no longer have to waste years of their life agonizing for a cure that doesn't exist. You already have the cure because you are the cure. All you need is a little guidance and support to help you better understand yourself so you can address it at the core and implement the tools that will aid you in greatly reducing anxiety in your life. That doesn't sound so bad, right? We all know stress causes disease. And knowing that causes more stress. All of this becomes a vicious cycle that appears to be never-ending. But it can and will end. You just need to disrupt your current thought patterns. You're already in the midst of what will probably be the most daunting challenge you'll ever face. I could put forward an argument that climbing Everest would be easier, and you wouldn't do that alone, so why would you do this alone? With the right support, you'll be shocked by just how quickly you can turn your life around. I'm going to make it as easy for you as I possibly can, but I need you with me. And I need you to trust me when I tell you that if you sit with this and hope for it to go away—it will only get worse. There is no shame in any of this. It's normal. That was after two days. Thing continued to get better. It took me a very long and painful 13 years to figure this stuff out. Most of the help I received was useless because I never had the luxury of sitting down with someone who understood what I was going through. I was never told what anxiety was, why it had taken over my life, and what I could do to get my life back. The Free Your Mind from Anxiety program will provide you with the tools and support required to completely transform your relationship with anxiety. I’ve read hundreds of books, taken dozens of courses, and made almost every mistake imaginable as I amassed a whole lot of wisdom on one of the most crippling conditions we face in society today. This program will teach you all the good stuff, and you'll have my support every step of the way. It takes two months to finish, but you’ll begin to feel better immediately. The choice is yours. All you have to do is sign-up and commit. What area of your life is causing you the most anxiety? How long have you been living like this? On a scale of 1-10, how would you rate your anxiety?On a scale of 1-10, how would you rate your anxiety? Please tick the areas of life you are currently unsatisfied with? Do you have a diagnosis? If so, what is it? Are you prepared to commit up to an hour a day and engage in this community for two months to drastically improve your quality of life? Thank you for your application. You will shortly receive an email inviting you to schedule your free consultation. Contact nicky@nickycullen.com if for some reason you do not receive this. Due to my experience and all I've learned, I'm now on a mission to help as many people as I possibly can from a life torn apart due to anxiety. I guarantee if you commit just one hour a day over the next two months, you will experience a significant improvement to your anxiety. And if you continue to do the work, you'll begin to experience magic you might not think is possible right now. I know an hour a day over two months might sound like a lot, but it's only a blink of an eye when you compare it to the time you stand to lose. And you'll begin to feel better much sooner than that. Now's the time to do the work. To experience real freedom from anxiety—you have to change your relationship with it. This program is only for those committed to changing their relationship with anxiety and doing the work. It is not for you if you haven't yet accepted that something which may have stemmed from childhood and taken years to manifest won't just disappear. Full support from someone who's been through it all and successfully helped many people before transform their relationship with anxiety. A private community of like-minded individuals supporting each other. A safe environment to do the work. A greater understanding of your anxiety and where it comes from. Tools to forgive and move forward with your life. A better understanding of your emotions. Tools to better manage and control your emotions and stress levels. I've made all the mistakes for you. And I learned all my lessons the hard way. It cost me thousands of dollars and years of life to figure this stuff out. You don't have to make the same mistakes I did. The Free Your Mind from Anxiety program will ensure it, and in doing so, significantly reduce your anxiety and improve your quality of life. It's that simple. And it comes with no-risk because if you don't consider this to be a good investment, I'll refund you all your money. No questions asked. Send an email to nicky@nickycullen.com if for some reason you do not receive this. A significant reduction in stress. No longer walking around in a constant state of worry. The course is structured to be encouraging, supportive, engaging, and fun so you get your desired results. Delivered online, everybody is fully supported within a private community. In addition, there is live Q & A throughout to address whatever questions arise, as well as additional video content which I share as I continue to study and learn. You'll also have my WhatsApp number to reach me anytime. 13 video modules which include coursework will equip you with tools to better manage your anxiety, and provide you with a greater understanding so you can address it at the core. 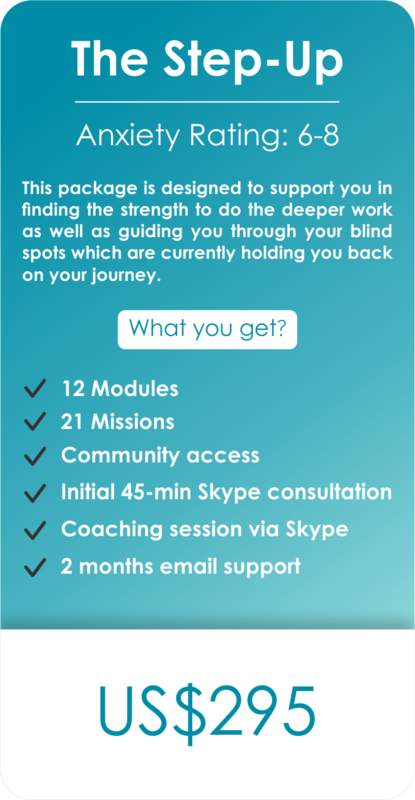 Over the course of two months, you will receive 21 missions designed to get you out of your head and aid you in systematically breaking down your anxieties. You'll also have a little fun in the process. Yay! What better way to succeed than by going through this with like-minded individuals sharing, inspiring, and supporting each other throughout? Questions will arise, and challenges will be met. There is a live video Q & A within the community to help with any challenges to ensure you overcome any obstacles along the way. I'll also answer specific questions privately via email or voice recorder. I can't explain in writing just how committed I am to helping you achieve the freedom you are looking for. I’m fully committed. I want nothing more than you to start smiling on the inside. Therefore, I'll be there every step of the way doing everything in my power to ensure you get the results you deserve. I'm in it with you all the way. If you apply yourself, I have no doubt you will greatly reduce your anxiety, and improve your quality of life. The question remains: Are you ready to transform your relationship with anxiety? If this is something you need, the best gift you can give yourself is the gift of commitment. A few months can change your entire life. All you have to do is decide to take action right now for the good of your health.